Finally finally after talking the talk about IPYPIASM at Ignite Dublin earlier this month, I walked the walk and put two poems in two shops yesterday. This wine wants to have its way with you. warm you, make you smile, lower your defences. your tongue, your mouth, yes, your lips. Then a beaker of decaff Capuccino and a choccie from the lovely Butlers Coffeeshop leaving A Matter of Taste for other coffee imbimbers to relish. smooth with an undercurrent of bitterness. Any more? Newbies extremely welcome. 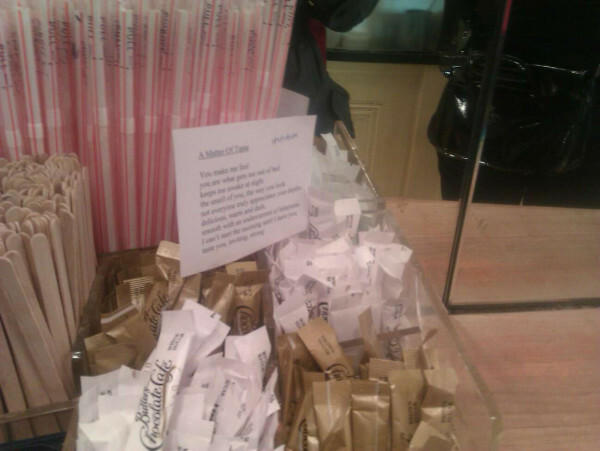 Guerilla poetry rocks! Nice one Emerging! You're up on the wall of fame now. Nice ones Kate and so appropriately placed too. Actually if I was the store manager I'd leave them up!! Huzzah! Great poems, great places. Plus wine and coffee. What's not, as they say, to like? 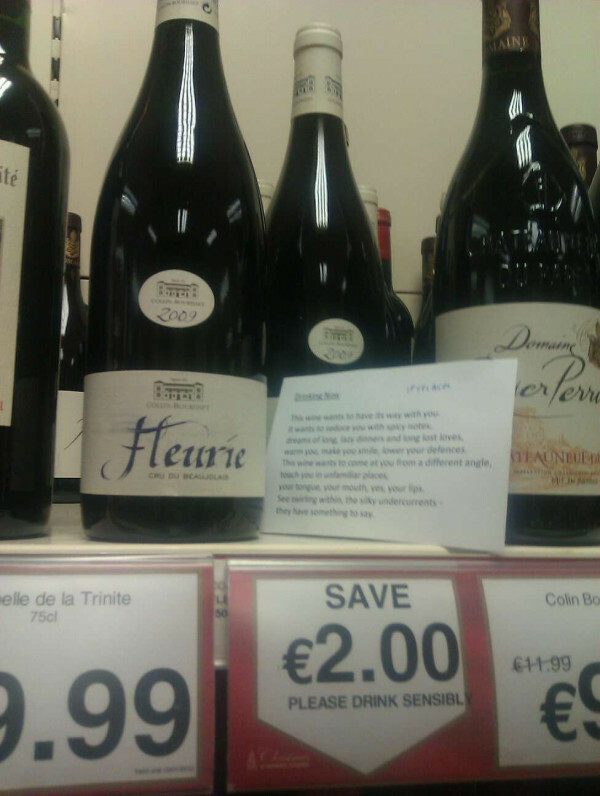 Well done Emerging Writer - I agree with Peter, the store should leave them there! I do believe the room was getting a bit warmer just reading those poems. Well done! I can’t start the morning until I have you. Great line:) Well done onyour IPYPIASM! Thanks Niamh. Amn't I in brilliant company?! Thanks Peter, I bow before you superiority. I just get so nervous. Thanks Louise, are you joining in? Well, Bug, everything in moderation. Hi Acorn, I'll take every bit of warmth I can get this time of the year.